I decided to give oatmeal a try after watching Alton Brown. 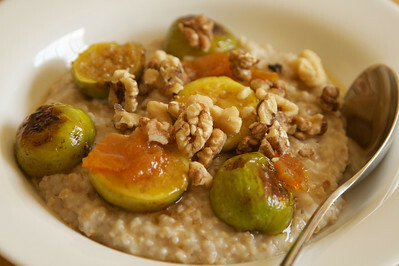 Before steel cut oatmeal became part of my daily diet, I had unsuccessfully tried several instant oatmeal versions. The steel cut variety is actually tasty. The grains are bigger resulting in chewier texture and the flavor is distinctly nuttier. Here is my dessert like version that is tastier than AB’s. 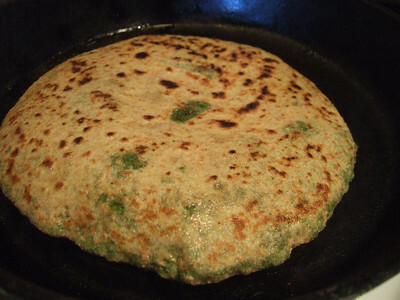 Flatbread stuffed with peas (matar paratha) is a wholesome meal. If made correctly, it can provide protein and sufficient fiber while being low on fats and simple carbohydrates. Traditional way of making this flatbread is too heavy on fats and simple carbohydrates. But this variation, like the cauliflower stuffed flatbread, is a new way of cooking and is heart healthy – only 1 Tbsp oil and a full 20 gm of fiber per serving.